Let us not miss Solar Entertainment Female Channel's first ever event of beauty and fashion - the GLAM CAMP - which will be held this coming August 6 and 7, from 1PM-10PM! 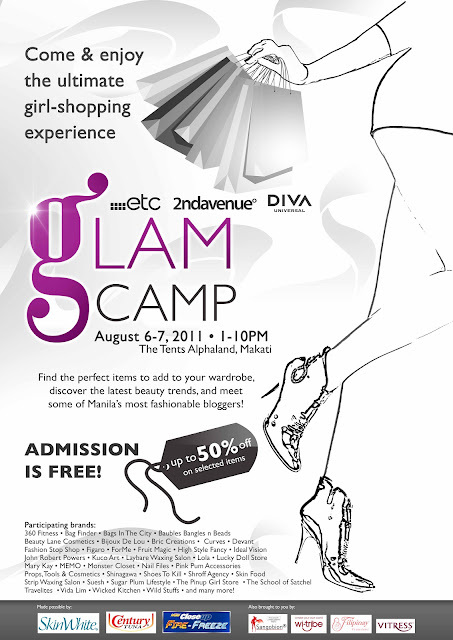 This ultimate girl-shopping experience will take place at The Tents Alphaland, Makati. A lot of brands will be participating and you can also have the chance to meet some of Manila's most fashionable bloggers. Admission is free! I'm so excited for this event! Hoping to finish my Mandarin exam early so I can raid this event! yay! hope to see u there!